2010 ( NZ ) · English · Thriller · PG-16 · 90 minutes of full movie HD video (uncut). You can watch Bloodlines, full movie on FULLTV - Dr. Colin Bouwer, chief of psychiatry at a renowned hospital, starts a murderous plan. For more than three months manipulates drugs to poison his wife Annette, causing a slow and painful death. 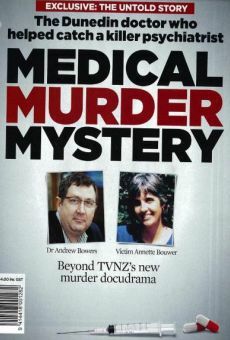 It would be the perfect crime, until a young doctor decides to investigate the causes of death of Annette, putting his career and reputation at risk. This doctor tenaciously pursues the truth and refuses to back down, convinced that Bouwer murdered his wife by lethal doses of insulin. You are able to watch Bloodlines online, download or rent it as well on video-on-demand services (Netflix Movie List, HBO Now Stream), pay-TV or movie theaters with original audio in English. This film was premiered in theaters in 2010 (Movies 2010). The official release in theaters may differ from the year of production. Film directed by Peter Burger. Screenplay written by Paula Boock and Donna Malane. Film produced and / or financed by Screentime. As usual, the director filmed the scenes of this film in HD video (High Definition or 4K) with Dolby Digital audio. Without commercial breaks, the full movie Bloodlines has a duration of 90 minutes. Possibly, its official trailer stream is on the Internet. You can watch this full movie free with English subtitles on movie TV channels, renting the DVD or with VoD services (Video On Demand player, Hulu) and PPV (Pay Per View, Movie List on Netflix, Amazon Video). Full Movies / Online Movies / Bloodlines - To enjoy online movies you need a TV with Internet or LED / LCD TVs with DVD or BluRay Player. The full movies are not available for free streaming.